Lots of tourists swarm the main island in Paris, the Ile de la Cité, home of the Notre Dame Cathedral. But far too many overlook its delightful little sister, the quaint Ile Saint-Louis, which is just a few steps away in the Fourth Arrondissement. This small island is like an oasis from the rush of the city. It's almost as if someone dropped a small French village into the center of Paris. It contains everything you would want from your neighborhood: markets, bakeries, fromageries, and cafes. While much of Paris has modernized over the years, this island remains romantically frozen in the 17th century. It is remarkably the same as it was centuries ago. The Ile Saint-Louis is connected to the rest of Paris by four bridges to both banks of the Seine River and to the Ile de la Cité by the Pont Saint-Louis. Those who like more of a small-town feel. Those who appreciate historic neighborhoods and old towns. Those who appreciate a fine meal at a sidewalk cafe. Those who prefer to be in the center of it all without the crowds. Tourists who prefer to live like locals. Anyone who loves to shop but abhors chain stores. Berthillon ice cream. The only true Berthillon can be found in the few small blocks that make up the Ile Saint-Louis. This delicious ice cream and sorbet has rich colors and equally intense flavors. It comes in myriad flavors, but the dark chocolate (chocolat noir) and mango (mangue) are without peer. Summer or winter, this is a real Parisian delight. For true authenticity, try this treat at 29-31, Rue Saint-Louis en l'Île, where it was started. Boutique shopping. The island's main street, Rue Saint-Louis en l'Île, features many specialty boutiques and shops. Although they can be both trendy and overpriced, this is still an ideal spot for discovering unique souvenirs. There is an upscale toy store, a shop devoted to handcrafted puppets, a chocolate shop, a couple of gourmet shops, and art galleries. Try L'ile Aux Images for vintage photographs and lithographs of old Paris. Performers at Pont Saint-Louis. The small bridge that connects Ile Saint-Louis with Ile de la Cité is a popular spot for street performers, be it jazz bands, jugglers, or mime artists. Relax and enjoy the show with your Berthillon ice cream. Saint-Louis en-L'Île Church. Started in 1664 and completed in 1726, this atmospheric Baroque church invites you in with a vast, stunning wooden door decorated with angels. Inside, it is surprisingly impressive and immense. A great meal: There is an amazingly high number of restaurants on this island, considering the tiny size of it. There are several concentrated near Pont Saint-Louis, and all are good. Many of the restaurants are upscale and expensive, but you can find a few cafes and bistros that are a bit more affordable. A drink at Au Franc Pinot. This has been a popular watering hole since the 17th century, and it remains so to this day. Pleasantly not a tourist trap, this bar oozes with the French laissez-faire attitude. As enchanting as the Ile Saint-Louis is, no Paris neighborhood is an island unto itself. Because the island is almost dead center in the city, many great attractions are within walking distance. Notre Dame Cathedral. 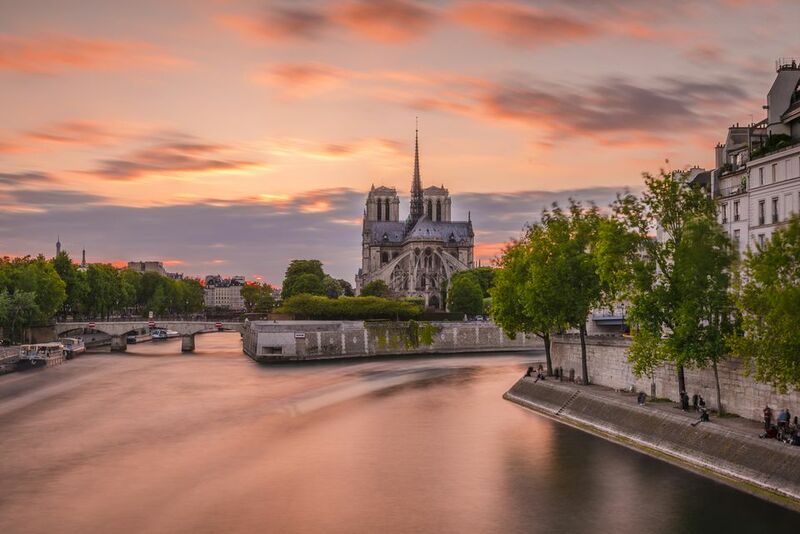 This lovely cathedral, which is a short walk across a bridge, is the setting for the classic novel The Hunchback of Notre Dame by Victor Hugo. Be sure to walk up the seemingly endless spiral stairs for a stunning view of the city, a close-up and personal peek at the famous gargoyles and a glimpse of the hunchback's famous church bell. Seine River. It literally surrounds this island and is one of Paris' best attractions (and, as a bonus, it's free to visit). You can hardly say you've done Paris unless you kiss your sweetheart while on one of the bridges across the Seine. Centre Georges Pompidou. This modern art museum is worth a visit even if you never go inside. The colorful Stravinsky Fountain is a perfect backdrop for family travel photos. The building's unique architecture has expanses of industrial tubing. Inside, there are many works of modern art, a great gift shop with wacky items, a huge bookstore with titles on nearly any aspect of art, and a free ground-floor exhibit. Although there aren't many hotel choices on the island, it is hard to go wrong with the options available. The four-star Hotel Jeu de Paume combines history, sport, and fine lodging. A former royal tennis court, this lovely hotel features a glass elevator with a view of the indoor courtyard with its ceiling stories above it. The rooms are especially large for Paris. The three-star Hotel des Deux-Iles is housed in a residence from the 17th century, and it combines historic charm with a modern sensibility and intimate surroundings. Take the Metro to the Pont Marie stop, and then cross the bridge. From Ile de la Cité, walk left of Notre Dame Cathedral's facade and then head to the back side of the church. Follow the road to the bridge and then cross. What Is the Ile de la Cité in Paris?